Mahmoud Abdul-Rauf is still not sorry. In 1996, the NBA star point guard shook up the league and the larger sports world by refusing to stand up for the National Anthem. Abdul-Rauf, who converted to Islam after growing up in Mississippi, believed the flag was a symbol of oppression by the United States government and standing up for the flag was in conflict with his religious values. Although the NBA and Abdul-Rauf found a compromise where he would stand for the anthem but pray with his eyes closed, Abdul-Rauf’s burgeoning basketball career soon derailed. Five years after the controversy, he was out of the league. His hometown house was burned down, and he received numerous death threats. 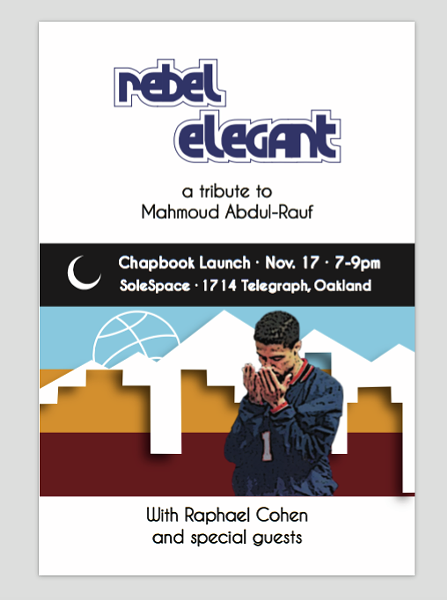 Twenty years later, San Francisco 49ers quarterback Colin Kaepernick reignited the same, dormant powderkeg, and amid the national controversy, Oakland’s Raphael Cohen is helping us remember Abdul-Rauf’s trail-blazing protest with his new book of poetry, Rebel Elegant: A Tribute To Mahmoud Abdul-Rauf. On Thursday, November 17 at Solespace, Cohen will present poetry, visual art, and social commentary inspired by the athlete’s short-lived protest. Other local writers, musicians, and artists including Ras Ceylon, Josh Healey, and Breena Nunez will join Cohen in sharing their thoughts on the diminutive basketball star who rattled an entire nation.